One of the chief complaints about the health care bill the House of Representatives passed on Saturday is that it's too expensive, with a staggering price tag of $1.1 trillion over ten years. While the House bill admirably extends coverage to an additional 36 million Americans, it's a lot to spend on a law that doesn't adequately address the spiraling costs of health care. Under the House plan, more Americans would have health insurance coverage, which would mean they'd have greater access to medical services and would likely seek care earlier. That would save money, as would other aspects of the House and Senate bills, such as reducing Medicare payments. But if we really want to contain costs over the long haul, we have to shift our efforts toward prevention. In a speech last year, John Clymer, president of the Partnership for Prevention, said that 70% of our health care dollars are spent on treating preventable conditions like cardiovascular disease, cancer, diabetes and hypertension. "In fact, 95 cents of every one of the $2.1 trillion that the U.S. spends on health care go to treat disease after it occurs, leaving less than a nickel of each dollar to invest in preventing those diseases," said Clymer. Likewise, in an interview in October on Larry King Live, alternative medicine pioneer Andrew Weil, M.D., pointed at that we spend more per capita on health than any other developed country but it doesn't improve health outcomes. "We've been paying more and more and getting less and less for it, and if we don't do something about this it will sink us economically," said Weil. "We'll be spending up to 20% of our GNP on health care, and we can't sustain that. It will bankrupt us." A large part of the problem is that doctors have little if any incentive under the current fee-for-service system to help patients lead healthy lives. For example, if you make an appointment with your doctor to discuss how to go about losing the extra 25 to 50 pounds you've been carrying around, he or she will most likely sit you down for a nice chat about eating more fruits and vegetables and exercising. Your doctor may refer you to a program like Weight Watchers or recommend a nutritionist. But the time your doctor might spend with you on that visit typically would not be billable, because there is no code for weight loss. That's right: If you're obese, your health insurance plan might cover gastric bypass surgery, and plenty of drugs to treat related conditions like high cholesterol and high blood pressure. But insurers won't pay a physician for a visit where he or she does nothing else but counsel a patient about weight loss. This is hard to believe, but in fact, insurance company reimbursements are often arbitrary and nonsensical, as I pointed out in a previous column. More to the point, the reimbursement system is perverse. 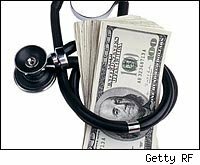 Dr. Weil summed it up best: "At the moment, insurance companies happily pay for drugs, procedures and expensive diagnostic tests. There is no reimbursement for doctors to sit with patients and give them advice for proper lifestyle choices," he said. "Our priorities are completely backward: We don't pay for preventive strategies -- we pay for interventions." There needs to be some effort in the final bill to address this imbalance and promote policies that support prevention. The problem is, I don't think Nancy Pelosi or any of the other members of Congress have been inundated by calls or cash from special interest groups fighting for "lifestyle choices." If there were as many ads promoting healthy lifestyles as there are for treating erectile dysfunction and sleeping pills, maybe we'd actually make progress toward becoming a healthier nation and curbing health care spending. Russell Turk, M.D. is an obstetrician and gynecologist in Fairfield County, Conn.